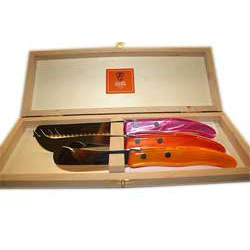 The Claude Dozorme firm, founded in Thiers, the French cutlery capital set in the heart of the Auvergne volcanoes, is a pioneer for its product ranges and manufacturing techniques. Claude Dozorme has official recognition as Master Cutler. The Berlingot range features a burst of color, reflecting a "joie de vivre". Brighten up your table with quality servers, now in 12 colors. Dishwasher safe.